Friday Night Fever is a University of Wyoming student group that provides alcohol and drug free activities and events for students. The activities and events are held every Friday night. For our last class project, we made a two minute video that highlighted comedian Vinnie Montez at a Friday Night Fever event. I paired up with Kaitlyn because we work well together. Kaitlin and I both recorded the event in order to get numerous angles and shots. Kaitlyn did most of the video editing, while I did most of the interviewing. I firmly believe Kaitlyn and I made a good team, and therefore made a great video. I enjoyed interviewing Vinnie Montez. His comedy show was hilarious and he was very goofy. But, when we sat down to interview him after the show, he was very serious and professional. It was interesting to see how different his stage presence and persona is compared to how he is in real life. I wish that we would have interviewed more people. Interviewing audience members after the show would have been a great addition to our video. Our equipment was not state-of-the-art, and we used two very different devices. If our video cameras and recording devices were better quality, our video would have been much better. The video turned out very small. I think it would be better if the video was larger and of better quality. I could definitely see myself doing video in a future career. I think that video is a great way to communicate with numerous people. I will need a lot more practice on my recording and video editing skills in order to create higher quality videos. I really enjoyed this project. I think that the comedy event was extremely entertaining, which made this project very fun and enjoyable. I chose to live tweet a football game because I thought it would be fun and it would help me learn how to create quick concise and informative tweets in a short period of time. I went on a vacation to San Diego and attended a San Diego Chargers versus New England Patriots football game. It was the first NFL game I had ever been to, so there was a lot to take in. I tried to vary my tweets. I not only included information about the game but also about the weather and atmosphere of the event. I enjoyed this project very much. I thought that it was fun having to come up with interesting and captivating things to say in such a rushed amount of time. I sent out my first tweet at exactly 5:30 with kickoff. After my first tweet was sent, my phone lost service. I attempted to use my friends phone, but was unable to get service throughout the entirety of the game. Because I was having technical difficulties, I recorded my tweets in the notes folder in my phone. I found this to be very frustrating and annoying. I firmly believe my live tweeting project could have been better if I was able to post the tweets during the event. I wish I could have interviewed more people from the event. Interviewing coaches, players or even the media for the teams would have been beneficial and interesting. There were thousands of people at the event and it was nearly impossible to talk to anyone who wasn’t a fan or on the event staff. Because of this I chose to interview fans from both teams. I appreciate that the fans I interviewed had very different views and opinions about the game, considering they were fans for opposing teams. Overall, I enjoyed this project very much. I am curious as to whether doing a different event would have been more or less difficult for me. Twitter is a fantastic way to relay a short amount of information in a timely matter. The Indian Fabric Fashion Show held at the University of Wyoming raises money for underprivileged girls. The event features items made of Indian fabric available in a silent auction. Money raised from the silent auction will support the University of Wyoming’s Keep Girls in School Project. All proceeds from the event will go to the Aarti Home in Andhra Pradesh, India. The Aarti home is an orphanage that houses and educates over one hundred girls. Creating a Soundslides Project covering the Indian Fabric Fashion Show Event took a lot of time and work. I did the audio part of the assignment and Kaityln did the photography part of the assignment. I enjoyed working with Kaitlyn on this project because we had good communication. There were numerous people at the Indian Fabric Fashion Show, which made the location very loud. I found it difficult to record clear and clean audio because of the background noise. I attempted to lead interviewees to a more quiet location for interviewing, but found that many of them did not want to leave the site of the event. I edited the auto on my MackBook Air, using GarageBand. When editing the audio I found that using “fade in” and “fade out” made the audio cuts less choppy. To take away from the background noise in some of the interviews, I incorporated a quiet undertone of music. The live music entertainment that I recorded at the event was extremely loud, so I used the editing tools to lower the volume of the audio. I thoroughly enjoyed the Soundslides Project. I think that combining images with audio is interesting and entertaining. I enjoyed working with a partner because it demanded teamwork and mutual dedication. I think that learning how to work with other people is extremely important and valuable. The Indian Fabric Fashion Show was a perfect event to cover for this project. I am confident that Kaitlyn and I’s Soundslides Project is informative and successful. Audio is a fantastic way to record information. The process of producing an audio profile interview can be very difficult and time consuming. Recording audio is much easier than editing audio. My audio editing experience was rewarding yet very challenging. I had never edited audio before this assignment, so the whole process was a learning experience. I did this project on my MacBook Air, so I used GarageBand for my editing program. The usability of GarageBand was very good. I learned to use the program through a GarageBand YouTube tutorial. Once I learned how to efficiently use the program, the audio editing process quickly began. I enjoyed organizing the audio clips. Putting the audio clips in a specific order was important to maintain the flow of the recording. I was able to organize the information in a way that seemed to tell a story, which I really liked. I did not enjoy having to create pauses. I needed pauses and quiet space in the audio profile in order to maintain flow, but it was very difficult. Adding pauses seemed to make the audio more choppy because Kaitlyn’s vocal frequencies fluctuated. I was surprised how time consuming this project was. It took me many hours to complete the edited audio profile. Editing five minutes of audio requires a lot more work than I expected. It is incredible how much information can be shared in such a short period of time. Cutting the audio from five minutes to two minutes was a much more difficult task than I expected. I wish I would have asked more specific questions in my interview. Asking more specific questions would have resulted in more detailed answers instead of vague and ambiguous explanations. Collecting detailed information in my interview would have allowed me to create a more informational audio profile. Overall, I enjoyed this project very much. I am confident that audio recording and editing skills are beneficial to me, no matter the career path I choose in the future. I do not have much experience interviewing, so this assignment was extremely beneficial to me. Prior to interviewing Kaitlyn Camargo I prepared five questions to ask her. I was confident that the five questions I prepared would easily create a five minute dialogue from Katilyn, but filling the entire five minutes seemed difficult. Five minutes sounds like a short period of time, but it seems much longer when conducting an interview. Interviewing Kaitlyn was not extremely difficult because I am comfortable with her. We have had multiple classes together, so it is easy for us to hold a conversation. I appreciated interviewing someone who I was familiar with because it was less stressful. Before I got interviewed, I was at ease and not intimidated. After the I answered the first question, I realized that I would need to use detailed descriptions in my interview in order to paint a picture with words and help the interviewer understand exactly what I was talking about. I found myself speaking rather quickly and getting more nervous as the interview was conducted. I think I was most stressed because I was aware of the time requirement for the interviewer. I continually looked at the time during the interview to make sure I was filling it with valuable information. I firmly believe if I was unaware of the time requirement, I would have been able to more successfully answer the interview questions without being nervous. I wish I could have conducted the interview several times, in both situations. I believe Kaitlyn could have given me more information if my questions were more detailed. I also believe I could have given more information if I was not aware of the time requirement, which made me rather nervous. Overall, this assignment was helpful in teaching me how to conduct a timely interview and also be interviewed. I look forward completing the next audio assignment in order to strengthen my skills. Roxanne Walker holds the ropes and watches her friend free climb a large rock wall in Vedawoo. 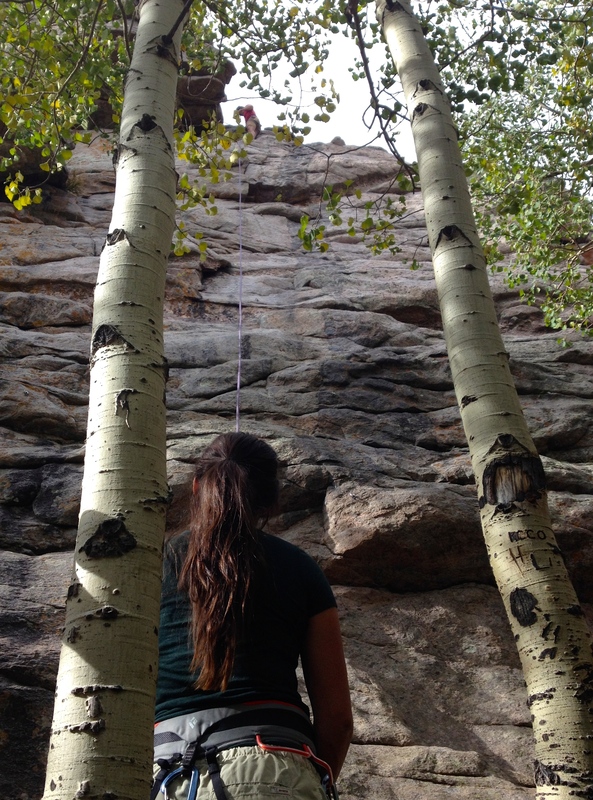 As I was on a long hike through the beautiful park, I saw a climber from afar. It was amazing and shocking how high he was climbing, using only his own strength. I made my way to climber and began capturing photographs. I knew I had to capture this scene in a unique way. The weather was mostly chilly and overcast, giving me the opportunity to shoot photographs at an upward angle without a glare from the sun. It took quite an effort to capture this exact photo. I wanted to capture the whole scene, using a specific viewpoint. If you look closely, the climber can be spotted at the very top of the photograph. The most prominent creative devices used in this photograph are viewpoint and establishing size. Specialist Matthew Muntzer and his daughter look at photographs of ocean animals on the Albany County Public Library computers. When exploring Laramie for photographs, I wanted to go somewhere that I could capture connections between people. I decided to go to the library because I knew there would be families there. As soon as I walked into the library, I spotted this father and daughter. I did not want to distract them or change them in any way, so I walked behind them and captured photographs. I then confronted Specialist Muntzer and had a fantastic conversation with him. He told be all about when he was a Public Affairs Specialist in the Marines. The job that he did is very similar to the content of this Online Journalism class. The dominant creative device in this photograph is the rule of thirds. 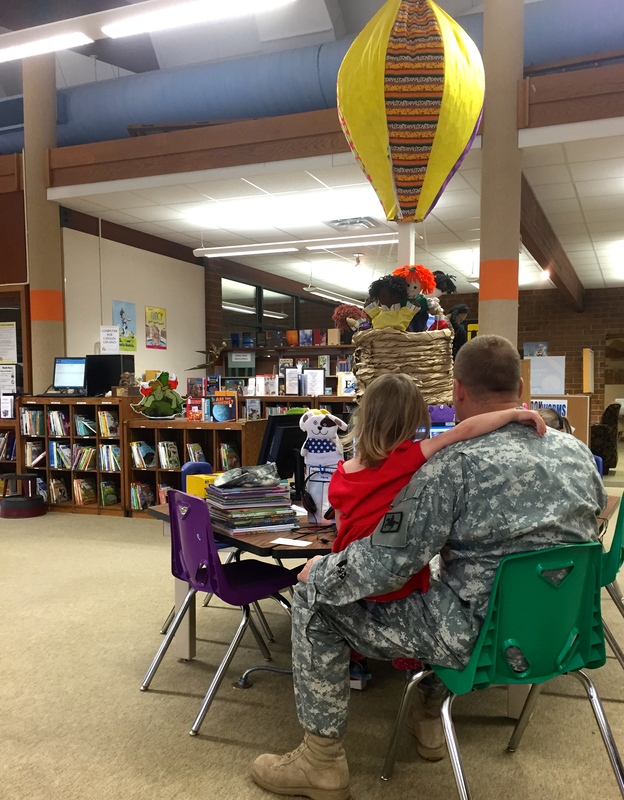 Specialist Muntzer and his daughter occupy the right third of the picture. 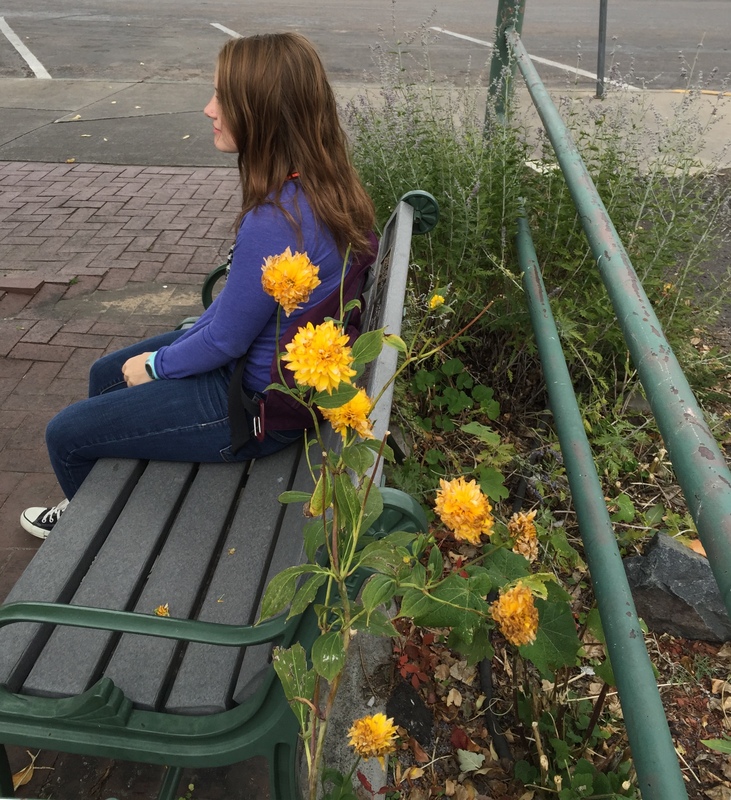 The University of Wyoming Navigators is a group of students who want to learn more about God. The Navigators desire to grow a deeper relationship with God. As I was leaving the library, I looked across the street at the west side of Fraternity Mall and saw a lot of action. From afar it looked like a group of men running around sporadically. As I made my way closer I realized they were playing a crazy game of frisbee. 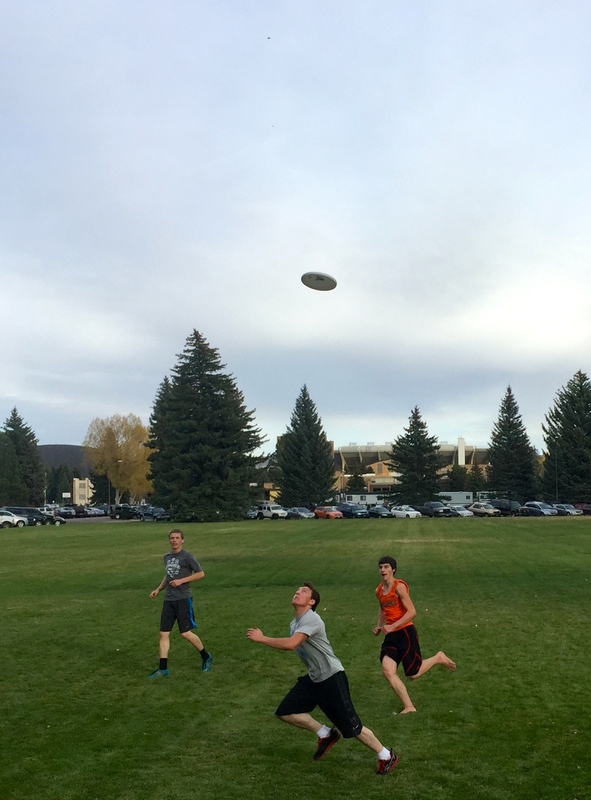 There were more than 15 of them playing the most intense version of frisbee I have ever seen. It was difficult to get this shot because there was a lot of movement. The main creative device in this picture is cropping. Using my own cropping skills along with some digital cropping, I was able to focus on this action photograph. A group of girls practice rugby the on east Fraternity Mall. 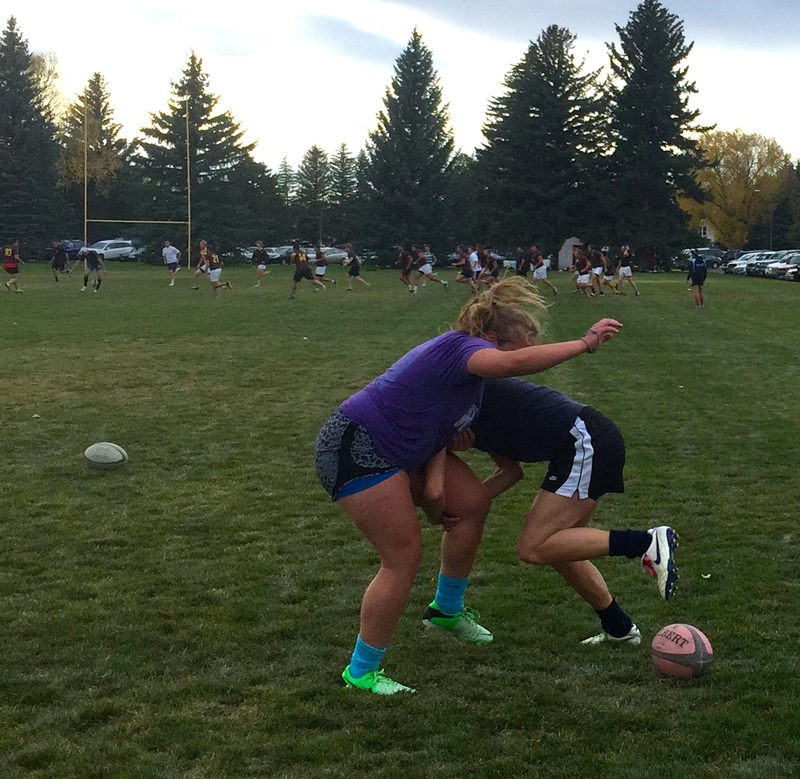 I have always heard that rugby is an extremely rough sport, but I had no idea exactly how rough it was until I saw these girls. As I was passing I took multiple photographs of them. The two girls in this photograph were very aggressive and intense. The dominant creative device in this photograph is focus. The main focus of the picture is the two girls in action, the viewers eyes are immediately drawn to the them. A man in a coffee shop in deep thought. 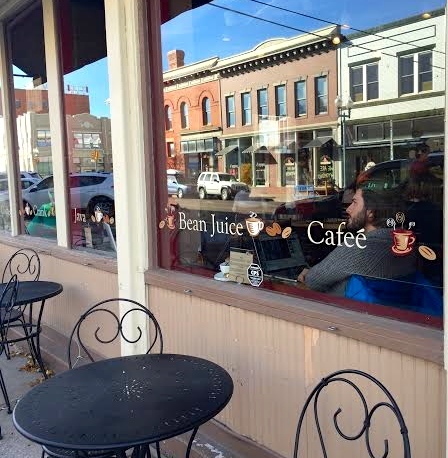 As I was walking around downtown Laramie I walked past a coffee shop filled with people. This man specifically caught my eye because he seemed to be in very deep thought. I really like the way this photograph turned out. I appreciate that you can see the reflection of the other side of the street in the glass. This picture follows the rule of thirds because the man occupies the right third of the photograph. I enjoyed this assignment very much. I like photographing people and connecting a short story to the photograph. Photojournalism, using both photographs and words, gave me the opportunity to create something more than just a simple snap shot. Taking imaginative photographs that capture composition is not easily done. I do not have much experience in photography, so this project was very beneficial and enlightening for me. To approach this assignment I first went on a walk in downtown Laramie, WY. I walked passed numerous shops that seemed too cluttered to photograph. Everything I captured seemed chaotic and busy. After walking around for quite some time, I decided I needed to change locations. As I was wondering back towards my apartment, I strolled upon a beautiful little park next to the Laramie Historic Railroad Depot. It was in this location that I captured my most successful photographs. This photographs prominent creative device is symmetry and patterns. 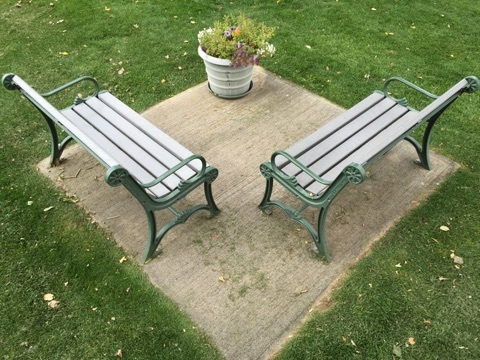 The two benches are identical and the flower pot serves as a focal point for the viewer. A second creative device of the picture is cropping. I had to stand on a large rock to capture this small section of the park. This pictures creative device is color. The bright yellow flowers pop out of the picture and attract the eyes of the viewer. The flowers are the only radiant color, so they are the main focus of the picture. The girl in the picture adds a balancing element as a second dominant composition. This pictures prominent composition is leading lines. The rail road tracks and rail road cars go the length of the entire picture in lines. A second composition in the “Lines to Mines” picture is symmetry. 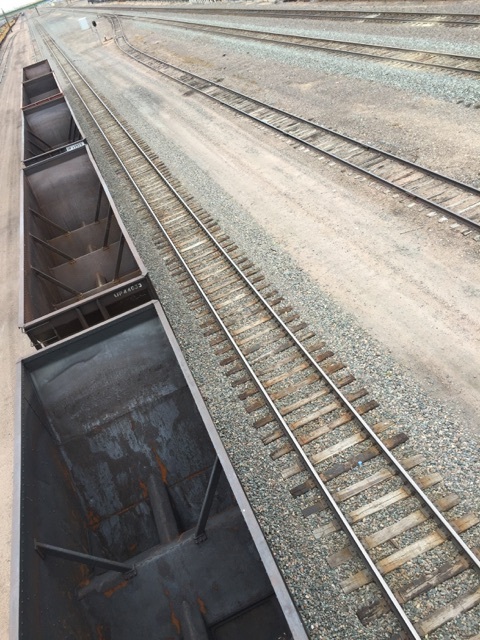 The railroad tracks are parallel to each other, showing a pattern. As I was taking pictures an older gentleman walked out of the Laramie Historic Train Depot. I started a conversation with him, telling him about this creative devices photography project. He then opened the doors for me and let me explore the whole old train station by myself. I spent quite a while exploring the historic building, it was really cool. “The Porcelain Trio” picture was taken inside of the Train Depot. 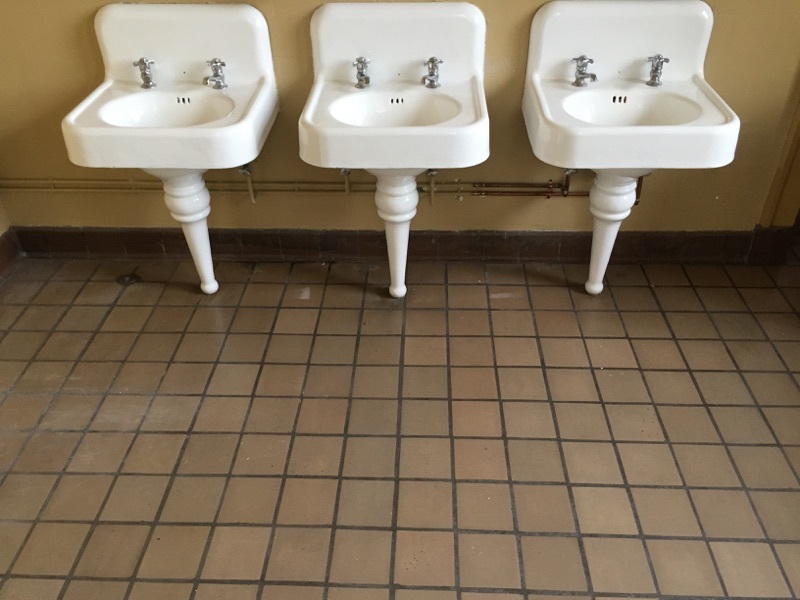 I thought the design of the old three sinks was unique and interesting. It represents the rule of thirds in composition because the sinks occupy the top third of the picture. This pictures most dominant creative device is viewpoint, in a more literal way. It shows how a young child would see the big train station. 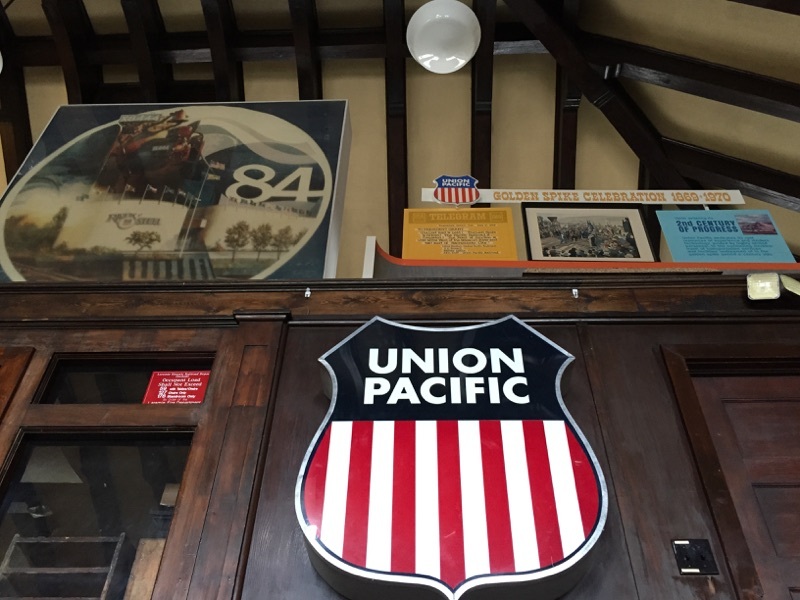 The title “UP” encompasses the viewpoint of a child and Union Pacific. I really enjoyed this assignment. I was not aware of the immense details behind the art of photography. Learning creating devices and composition in photography will aid me in my future photographing.